Franco Zeffirelli's bankability rose dramatically with a pair of international hits from 1967 and 1968, The Taming of the Shrew and Romeo and Juliet. Both were co-British productions with ample English and American talent. But lightning didn't strike a third time, as Brother Sun, Sister Moon lacks the romance and comedy of the previous two efforts. What's worse, this earnest but pandering story of the great pacifist saint plays like a limp celebration of hippie dropouts, only in the middle ages. Deserting from a crusade, Francesco returns to his father's store in Assisi and undergoes a personality change, becoming obsessed with birds and flowers and Christian pacifism. His fellow warriors eventually join him in restoring a ruined church, where they begin a communal existence, like the Lilies of the Field. 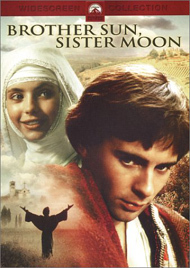 Paramount apparently tried their best to turn Brother Sun, Sister Moon into a counterculture hit. They chopped thirteen minutes out of the Italian cut and replaced the Riz Ortolani score with warbling songs by Donovan. That made for a good stab at a soundtrack album but it doesn't really change the movie, which is a flower-power version of the young Saint as he discovers his calling in life. Brother Sun, Sister Moon has reels of pretty long-lens zooms and TV commercial photography watching Graham Faulkner and his pals commune with nature. The main lesson taught is that aspiring to a holy state involves driving your relatives bonkers. Young Francisco refuses to talk and behaves like a dimwit after recovering from his war experience. But soon he's out on treacherous rooftops pursuing the bird of the air, to feel their love. It helps that his father (Lee Montague) is wealthy merchant, but he does cute things like giving all the dye workers the afternoon off and tossing his dad's entire mercantile inventory to the crowds. Finally Francesco strips himself of his clothing and wanders off naked into the world, to find the true meaning of living in Christian charity, filled with the love of God. At first shunned by adults and peers alike, Francesco's zeal at rebuilding a crumbling church fires his rich pals with the same fervor. Enter a rebellious teen sweetheart with a cherubic smile (Judi Bowker of Clash of the Titans), and Francesco's got himself a great commune going, with everything he needs except Wavy Gravy. Of course they live by begging, and their anti-greed lifestyle attracts the ire of neighbors and the church. A hate crime leaves one of the 'brothers' dead, so Francesco takes his troupe (men only) to Rome to ask for the Pope's blessing and an explanation of what they're doing wrong. Pope Innocent III (Alec Guinness, in a brief and dull cameo) silences his galleries of bishops and hangers-on when they oust Francesco for daring to spout gospel to his Holiness. Guinness calls them back, having been moved by Francesco's sincerity and humility. They get their blessing, and are free to go back to Assisi to keep doing their life's work of adoring God and begging. Cue the last Donovan ballad. Brother Sun, Sister Moon has sanctimonious Peace & Love stamped all over it. European films were going through a phase of Revolution-themed dramas and Spaghetti Westerns, but this one is different in that it is very pro-Church. Hippies are really true Christians, see? The Donovan songs sound vaguely like old folk tunes, but what the film really needed were titles telling theater audiences when to light up. I saw the film when it came out, and didn't remember a single song. I've forgotten them already after seeing it again. That's not quite the same impact as the soulful tune sung at the wedding in Romeo and Juliet, which has never left me. Zeffirelli made a couple more okay pictures before bombing out with the 1981 Endless Love. In this mad love saga, hunky Martin Hewitt proves his devotion to his teen heartthrob Brooke Shields by burning her parents' house down. That's only one step further than Francisco of Assisi, but a real turn-off for audiences, as the late 70s / early 80s were the years when average Americans realized that the goal of owning one's own house might stay out of reach forever. Valentina Cortese plays Francesco's amiable, befuddled mom in a couple of scenes. Adolfo Celi has a bit as a pompous church leader, fighting with his fellow churchmen about who gets the best positions in a holy procession. Paramount's DVD of Brother Sun, Sister Moon looks and sounds splendid, with particularly bright colors. There are no extras, but I'll be content with the 16:9 enhancement. One of the stills on the package back boldly shows a scene from another movie entirely - Tybalt and Mercutio fighting from Zeffirelli's Romeo and Juliet. Can't win 'em all.